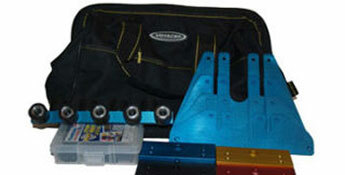 The Rolladeck Windshield Setting System is a kit compromised of a deck plate, 4 base plates and 4 slide plates. Together, these parts combine to create a solid platform that works like a platform to hold the windshield above the urethane. 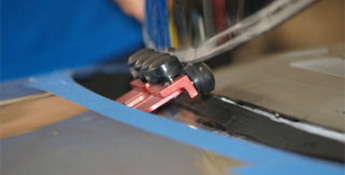 This allows technicians to easily slide the windshield and plate it precisely onto the urethane bed. The base plates come in small, medium, large and 1 inch clip-on styles to allow for different sized wiper blade posts. Each base plate can also be turned upside down to allow for different clearances and reach. The 4 slide plate sizes allow for tight clearances and wide spans. The slide plates also come with extra parts to allow for a drop-down configuration for different heights. The deck plate is the rolling channel within which the windshield travels to be set in.